‘A’& ‘B’ of AMIE examination conducted by Institute of Engineers in Electrical/Electrical and Electronics Engineering. recognized as equivalent thereto (or) a pass in Section ‘A’& ‘B’ of AMIE examination conducted by Institute of Engineers in Civil Engineering. AGE RELAXATION : As per the G.O.Ms.No.190 GA (Ser.A) Dept., Dt:08-08- 2017 as adopted by TSNPDCL vide N.O.O. (CGM-HRD) Ms.No.194, dt.13.09.2017, the Upper age limit is raised up to 10 years i.e., from 34 to 44 years. The Upper age limit prescribed above is relaxable up to 5 years in respect of SC/ST/BC candidates and up to 10 years in respect of Physically Handicapped candidates. Step:- Payment of Fee: The fee mentioned at para- I (5)(a) is to be paid online through TS Online centers duly following online instructions. 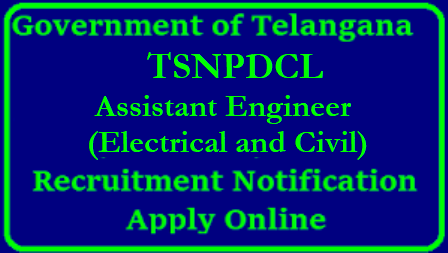 (c) After payment of Fee, the Candidate has to logon to the website http://www.tsnpdcl.in and click on APPLY ONLINE link or directly visit ttp://tsnpdcl.cgg.gov.in to view the detailed notification, User Guide and Application Form. The applicants have to invariably fill all the relevant fields in the Application. Immediately on submission of application the Applicant will get an acknowledgement in the form of a downloadable pdf document. The fee once remitted shall not be refunded or adjusted under any circumstances. Failure to pay the examination fee, application fee wherever applicable will entail the total rejection of application. Date of examination: The written examination for recruitment of Sub-Engineer/Elecl. will beheld on 15-07-2018 from 10.30 AM to 12.30 PM.